What is the RUNGU FAT-TRIKE? 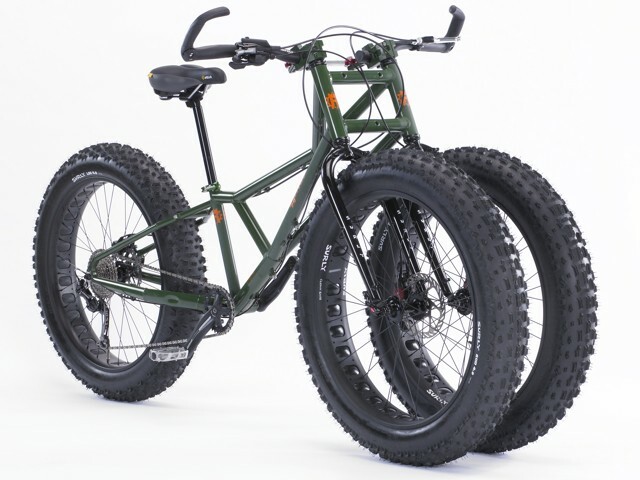 With their huge, soft tires that allow them to “float” over snow and sand, fatbikes have experienced a surge in popularity over the past few years. Last December, British adventurer Maria Leijerstam took things a step further, using a custom fat trike to ride to the South Pole. Now, California-based Standard Bearer Machines is offering a fat-trike of its own, known as Rungu. Unlike Leijerstam’s recumbent trike, the Rungu is an upright. While the pros and cons of recumbents versus uprights could be (and are) debated endlessly, the designers of the Rungu claim that their configuration offers better pedaling efficiency than a recumbent. As can be seen in the photos, it’s a tadpole trike, in which the single wheel is in the rear. A steering linkage system allows the two front wheels to pivot together. So, what’s the point? Well, the father and son team who developed the Rungu found that when transporting surfboards across the sand on a conventional two-wheeler, stability was an issue. The dual front wheels spread the weight out wider, helping to keep the bike and rider upright. The trike can also reportedly climb up short flights of steps with ease. That said, while the Rungu might indeed make a good beach bike, its usefulness on singletrack trails would presumably be limited – it looks like the two front wheels might straddle the trail instead of staying centered on it. There are actually two models of Rungu. The Juggernaut (above) features fat 26 x 4.7-inch tires all around, and is intended mostly for use on the traditional sand and snow. It weighs 55.8 lb (25. 4 kg), and is priced starting at US $2,500. The Kilimanjaro still has a fat tire in the back, but utilizes skinnier 29 x 2.5-inch tires in the front, along with 100-mm Rockshox coil spring suspension forks. It’s designed more for use on the road or hard-packed dirt, where speed and agility are more of a factor than having a wide footprint. It weighs 53.8 lb (24.4 kg), and costs $2,600. Both models feature mounting points for accessories such as e-bike kits and overhead racks. You can see them in action, in the video below.